Master Carver Peter Calvesbert was having an artistic dilemma. Should he carve a walrus or gorilla? He had just walked his son Sam to school and stopped in the local newsagent to buy his usual wildlife magazine when fate took a hand. 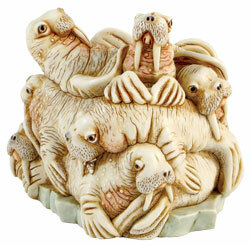 The magazine included five pages of fantastic walrus pictures. Many of the pictures showed the walruses squashed together, so Peter decided to explore what could happen if the icecaps do melt and the habitat of these large marine mammals shrinks even more. The inscription “BP 12/12/06” stands for Peter’s Bird of Paradise plant and the date when it finally flowered, after 10 years. Under a tail flipper is the name Lily Allen, an English recording artist whose album Peter listened to non-stop when carving this piece. “RAM 13d” references son Sam’s broken arm (RAM is a scrambled arm and 13d is 13th of December, the date of the accident). Within the box figurine is a walrus concerned about his weight, trying to eat five portions of fruit and vegetables, something Peter generally fails to manage unless one classifies chocolate biscuits as a fruit.